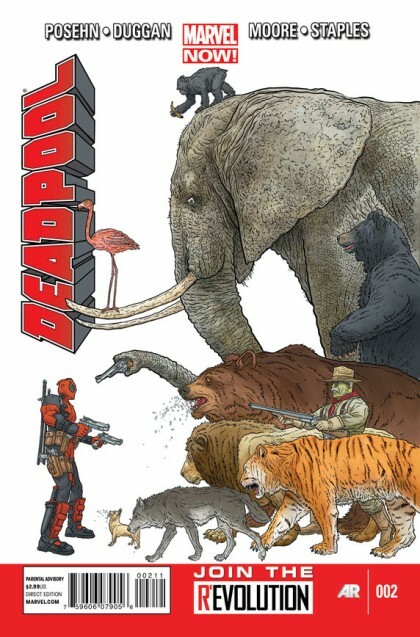 HEATHER’S PICK :: DEADPOOL#2: I find myself completely shocked to be selecting a Deadpool title to recommend this week. I mean, this is a character that previously fought a vampire cow, for goodness sake. (AND ate that vampire cow when he turned into a burger after being staked…) However the Marvel NOW team on Deadpool made me decide to give this title a chance and I am glad I did. Gerry Duggan and Brian Posehn’s writing is funny and on-point. Tony Moore’s art matches the playful spirit of the story very well. Geoff Darrow’s covers are wonderful and we can’t ignore the bang up coloring job by that sweet guy, Val Staples. I would also be remiss if I failed to mention that ex-president, Teddy Roosevelt, punches a bear in this issue. That’s right, punches a BEAR right in the face. Now that’s a leader a free world!